In April 2016, a new vision for the Kingdom of Saudi Arabia was revealed on national TV. The ambitious blueprint outlines a long-term plan for diversifying the country’s oil based economy. Set forth by Crown Prince Mohammad bin Salman, the Vision 2030 places Saudi citizens in the center of its quest for a post-oil era by recognizing Saudis as an untapped resource necessary for the country’s new economic plan. The vision sets forth a number of goals, one of which is improving the social, physical and psychological wellbeing of Saudis. In this chapter, we provide an overview of a growing positive psychology movement in the Kingdom, as well as the accelerating effects recent economic and social reforms have had on the movement. 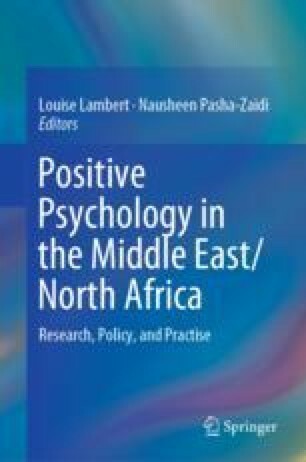 Additionally, we briefly discuss how the predominant religion of Saudi Arabia, Islam, contributes to positive psychology, the beginning of positive psychology education in the nation and, the prospect of an indigenous positive psychology as a result of establishing the Kingdom’s first positive psychology research lab. Al-Swailem, A. M. (2018). Introduction: National committee of bio ethics. Retrieved April 29, 2018, from http://bioethics.kacst.edu.sa/About.aspx. Community Jameel. (n.d.). Our initiatives—Together for good. Retrieved April 29, 2018, from https://www.cjameel.org/en/initiatives. Creative Mornings. (n.d.). About|CreativeMornings/Jeddah. Retrieved April 30, 2018, from https://creativemornings.com/cities/jed/about. How Saudi Arabia’s UN Envoy Announced the Women Driving Decree. (2017, September 27). Alarabia English. Retrieved April 29, 2018, from https://english.alarabiya.net/en/News/gulf/2017/09/27/Saudi-envoy-to-UN-breaks-news-of-permission-for-women-to-drive-amid-applause-.html. Jabalomar. (2017). In the framework of Prince Khalid Al-Faisal’s Initiative “How to be a role model”. Retrieved from https://jabalomar.com.sa/ Open image in new window . Jacobsen, D. (2013). Bibliography of workplace gratitude. Retrieved from http://www.globoforce.com/gfblog/2013/the-power-of-workplace-gratitude-a-brief-bibliography/. Seligman, M. (2009, September 25). Positive Psychology Center Report (Rep.). Retrieved April 30, 2018, from https://www.sas.upenn.edu/psych/seligman/ppcreport2009.pdf. Shababuna Creative Hub. (n.d.). A new platform for social innovation. Retrieved April 30, 2018, from http://lfalsharif.wixsite.com/creativehub. United Nations Development Programme. (n.d.). Environment and energy. Retrieved April 30, 2018, from http://www.sa.undp.org/content/saudi_arabia/en/home/ourwork/environmentandenergy/overview.html. Vision 2030. (2016, May 8). Vision 2030. Retrieved from http://vision2030.gov.sa/en.